As businesses grow, their needs change and CD DVD Replication may be required to fulfill the needs. Essential replication is used to mass produce the CD or DVD in greater quantities. The process also uses screen or offset printing to print the label or front of the disks. This process is used to produce many types and sizes of disks. To the left you can see the 8cm mini CD. However just as easly they could be 8cm mini DVD or the standard 12cm size. So you wish to produce some DVD's! Regardless if the CD or DVD are data like your office files, video or audio, they can be replicated/manufactured in the same way. Quick and efficient and above all more cost and time efficient than the duplicated disks. Packing, Storing and distribute CD DVD Replicated disks! We offer great range of packaging ideas, from the standard jewel case to clam shell style and post packs. Our trained staff can help you choose the best solution for your situation. All so you can make the decision what suit you best. For example: Replicated CD and DVD's destined for conference are usually placed within other publications and need just basic protection without adding to the total weight of the package being distributed. 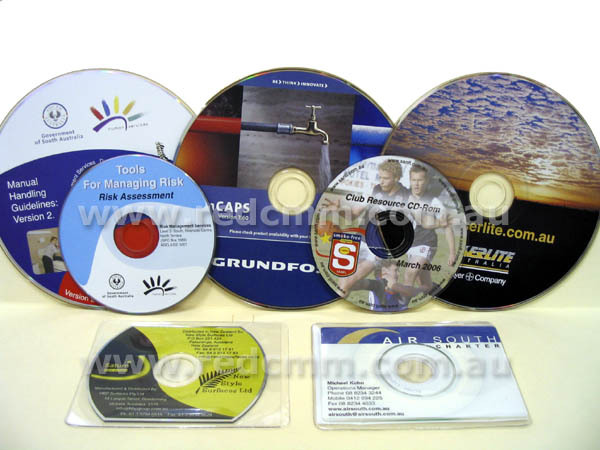 In this case transparent plastic sleeves are most commonly used.